These luxury albums with a leather cover are available in landscape or square format with a printable area of DIN A4, DIN A3 and 12x12". 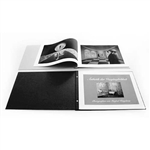 They are excellent for creating professional portfolios, high quality presentations, limited edition photo books and much more. Made from 100% cotton linters, the paper has a smooth surface and is extremely age resistant. The individual sheets are bound in leather with book screws. The screws are easily detachable so that the sheets can be removed for printing. Refill packs are also available.